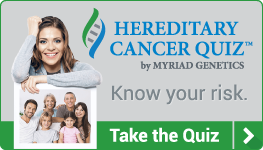 Myriad’s prognostic tests are designed to provide you and your patients with information about the aggressiveness of their cancer, allowing you to make better and more informed treatment decisions. Prognostic testing enables you to more effectively define a personalized treatment or monitoring strategy for each patient’s cancer. No two cancers are the same, and it can be difficult to predict which tumors are slow-growing and which are likely to progress or metastasize. Prognostic tests that measure the expression of genes involved in cell cycle progression provide information that, when used in conjunction with other clinical features, can help predict disease outcome and guide treatment. Managing localized prostate cancer presents a unique challenge because prostate cancer is highly variable and some tumors are slow-growing or nonaggressive. Monitoring tests such as prostate-specific antigen (PSA) level and Gleason score provide information on disease progression, but do not measure tumor aggressiveness. Understanding the aggressiveness of each patient’s specific prostate cancer can help you and your patient feel more confident about choosing the most appropriate treatment plan. *1,2 Prolaris® has been shown to effectively provide this information. In addition to Prolaris, Myriad is currently investigating prognostic tests for predicting the aggressiveness of other types of cancer. *Any discussion of medical management options is for general informational purposes only and does not constitute a recommendation. While genetic testing and medical society guidelines provide important and useful information, all medical management decisions should be made based on consultation between each patient and his or her healthcare professional. 1. Cooperberg MR, et al. Validation of a cell-cycle progression gene panel to improve risk stratification in a contemporary prostatectomy cohort. J Clinical Oncol 2013:31(11):1428-34. 3. Freedland SJ, et al. Prognostic utility of cell cycle progression score in men with prostate cancer after primary external beam radiation therapy. Int J Radiat Oncol, Biol, Phys 2013:86(5):848-853.